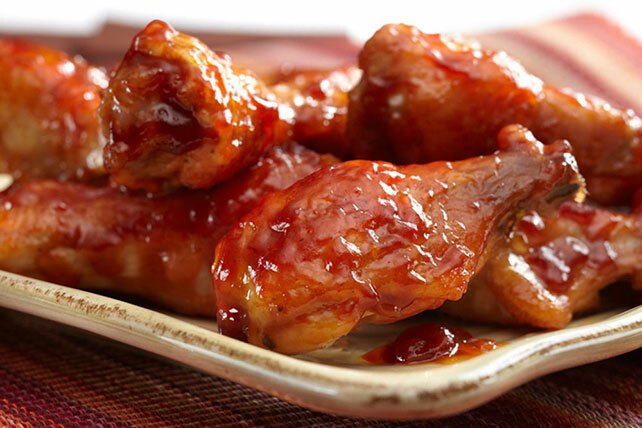 Find the perfect balance of spicy and sweet flavors with our Sweet and Saucy Chicken Drumettes recipe. Requiring only four ingredients, Sweet and Saucy Chicken Drumettes are incredibly simple to make. In fact, this recipe only takes 10 minutes to prep! Place chicken on foil-covered rimmed baking sheet sprayed with cooking spray. Bake 30 min. Meanwhile, mix remaining ingredients in medium bowl until blended. Add chicken, a few drumettes at a time, to barbecue sauce mixture; toss to evenly coat. Return to prepared baking sheet. Bake 15 min. or until chicken is done (165ºF).